Dang that week went fast, anyone else? Despite the days seeming longer with more sunlight in the evening, they still went by fast. I felt like i consistently looked at my watch one minute and it was 10AM then 2 minutes later it was 5PM. 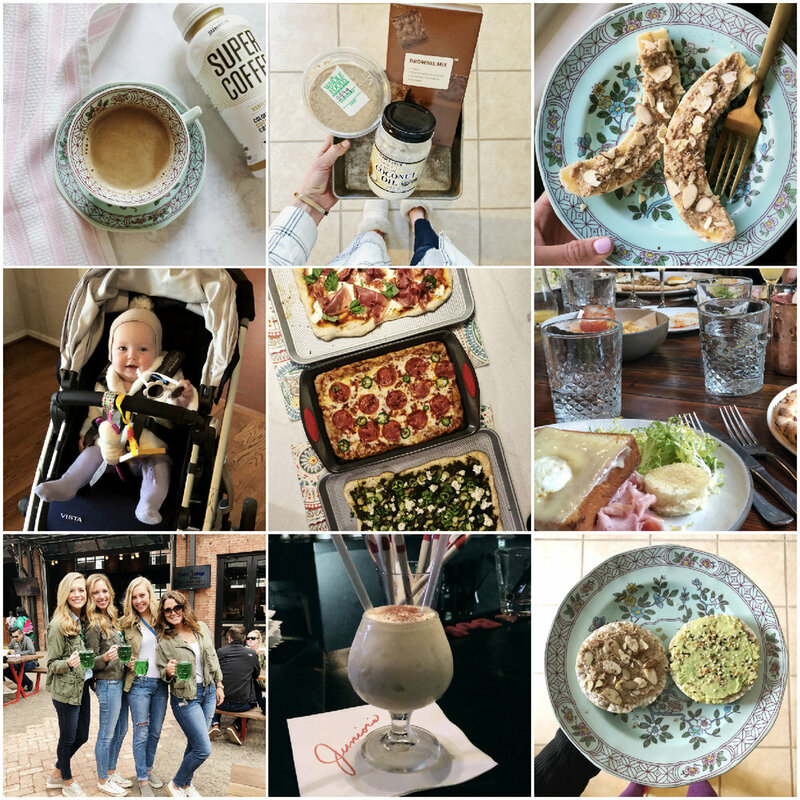 Energized by coffee, good eats, and a new workout routine with sis and Elle (we have started down the BBG rabbit hole, followed by walks with the almost 8 month old), all of a sudden it was the weekend. A weekend well spent with friends and lots of green. St. Patrick's Day is a pointless holiday that is way too fun to celebrate. I'm now exhausted from the fast and fun week and trying to slow my way into Monday mayhem. -Because of The Morning Breath, also seen on Shark Tank, I discovered Super Coffee. Shortly after being intrigued by the product and the three brothers behind it, I got in touch to get my hands on some. Just getting started on the East Coast, hopefully Super Coffee will be in midwest stores soon, but for now you can order online. -Banana split sans ice cream. -Morning walks with Elle are becoming a thing and I'm l-o-v-ing it! -A v successful pizza night, all tips and tricks learned from Gaby! -Pre-green beer brunch at The Jones! -Matching outfits and drinks this St. Patrick's Day. -If you know, you know. -Sweet and savory combo that I keep coming back too. AB, almond and cinnamon on one rice cake, and mashed avo with Everything But the Bagel seasoning on the other. I think October may rival to be one of my favorite months. The season really starts to set in, the weather actually starts to change and the month kicks off the holiday season. In saying that, this weekend indeed kicked off what is to be some good weeks ahead...I can feel it. My dearest sweetest best girl Katie got married and I was lucky to have a small part in her day. A gorgeous (unheard of) night, weather wise, set the tone for her big day. We drank, ate and danced the night away. The next day I spent lounging, lounging and some more lounging on the couch with family, friends, football and Chinese food. Then ended the weekend with a homemade pizza party. Let's go October! -Crushing so hard on this salad right now. I've eaten it five times in the past week. You have to try it! -My favorite lunch that keeps making an appearance. -New BA and BC on the TV. Perfect afternoon! -When you wear a royal blue jumper thinking you'll be "different." I guess great minds think alike! -I've waited years for Starbucks almond milk. It's here and it's everything. -Whipping my front porch into shape for October. Okay college friends, who's excited? I cracked the code on cookie pizzas. Whether it was someones birthday, finals week, a sisterhood event or sometimes just because, these cookie pizzas used to always make an appearance during my time at OU. A little shop just east of campus called Cookies and Cards, is responsible for crafting up these cookie pizzas. They had all different flavors such as chocolate chip, M&M, red velvet, lemon, but everyone knows the sugar cookie with fresh strawberry icing was the best. I ate too many cookie pizzas to count during my four years at OU. Since graduating I still think about them often. They weren't just a cookie cake, they were a cookie pizza. Very important fact. My new job has me working in Norman sometimes. It was my Maddie girl's birthday last week and I thought how fun it would be to surprise her with one of these coveted cookie pizzas. Work didn't pull me to Norman last week and I was too lazy to make the drive, so I thought why not make my own cookie pizza? Taking on this task involved a few requirements. The cookie needed to be slightly un-done and the fresh strawberry icing had to be spot on. You knew you got a good cookie pizza when it was basically dough in the center, and when you gpt one still warm, it was game over. The strawberry icing is what makes the sugar cookie flavor. This means puréeing fresh strawberries to achieve it. Good news Normanites, I think I did it. Several friends came over to celebrate Maddie's birthday and several went to OU. They all got a bite and agreed it was delicious and fulfilled the Cookies and Cards' cookie pizza shoes! Preheat oven to 350 degrees. Line a baking sheet with parchment paper. Using a large mixing bowl or round object, about 10 inches in diameter, trace a circle on the parchment paper. Flip the parchment paper over so you don't get any pencil or pen marks when you spread out the dough. Cream butter, oil and sugar in an electric mixer until light and fluffy, about 2 minutes. Add the egg and both extracts. Add flour, baking powder and salt, and mix on low until the dough comes together. With clean hands spread the dough out on the parchment lined baking sheet. Spread the dough out, filling the circle shape you drew. Bake for 10-13 minutes. Start on the low end. The key to yumminess in this cookie pizza is for it to be slightly underdone! You want to take it out just before it starts to brown. Let it cool completely. While the pizza cools, purée your strawberries in a food processor or high powered blender. In a stand mixer or using a hand mixer, whisk purée, butter, powdered sugar and vanilla on low until fully mixed. It should be the consistency of a thick glaze. Using a spatula, spread the icing over the cookie pizza leaving about a half inch border around the edges. Cut with a pizza cutter and enjoy! 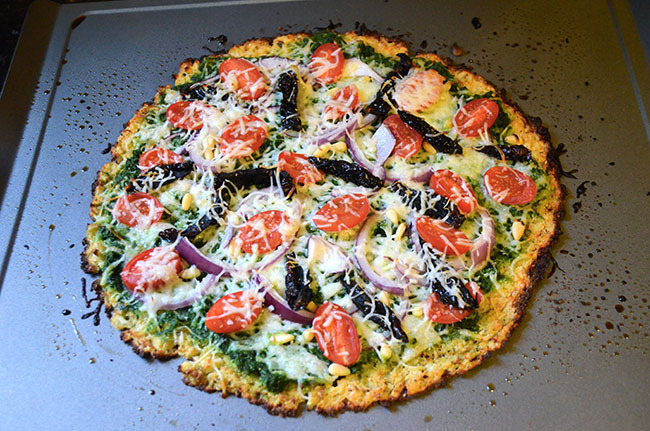 My friend Kate and I have had plans to make cauliflower crust pizza for a long time now. We made it Tuesday night and it totally lived up to the hype. When I asked Kate for a creative name we could call our za, Cauliflower Cutie is what she came up with....not really what I was expecting but we'll go with it! 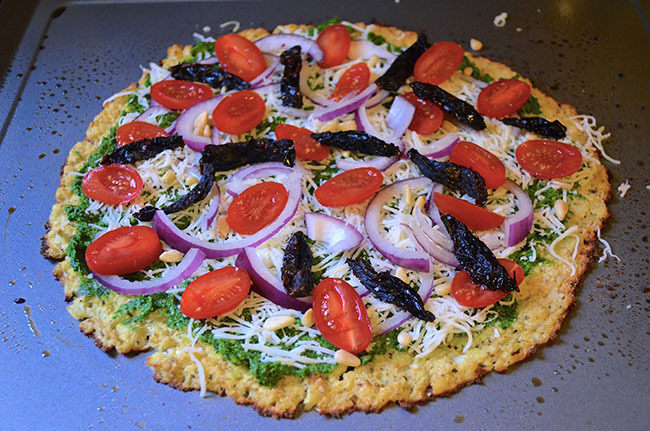 Going with the theme of a crust made from vegetables, we kept our pizza vegetarian. We did a little truffle oil, some of my homemade Kale Pesto, two kinds of tomatoes, pine nuts, red onion and more cheese, of course! I have to say the key was sprinkling a little extra grated parmesan over the crust before we cooked it! It worked as a binding agent and made it a little extra crusty. After taking a bite of our pizza, it was clear that it exceeded our expectations. We both agreed that we killed it. Bookmark this recipe and put it on your cooking list! Cut up your cauliflower into small floretsUsing a food processor, process the cauliflower to about the texture of powdery snow (I don't have a food processor and had to use my blender. I do not suggest this, it was a pain and took forever!). Dump the cauliflower into a microwave safe bowl and microwave for 4 minutes. Let the cauliflower sit until it's cool enough to handle. at this point, wrap it up in the dish towel and wring out as much liquid as you can. 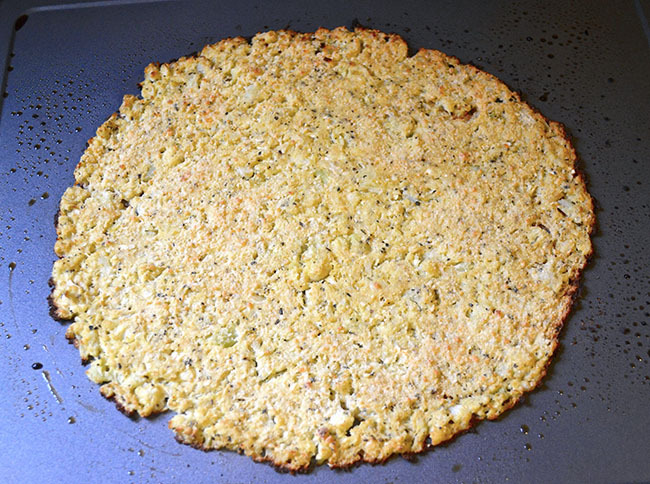 This will give you a chewy crust instead of a crumbled mess! 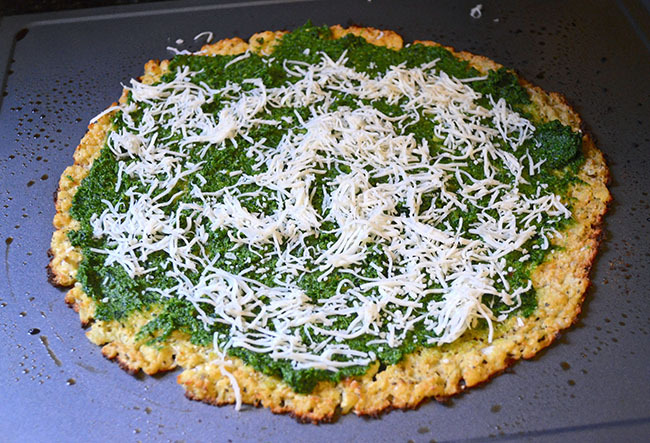 Dump the cauliflower back into the bowl and add the salt, basil, parm and mozzarella. Then add the egg and mix to combine, hands work best. 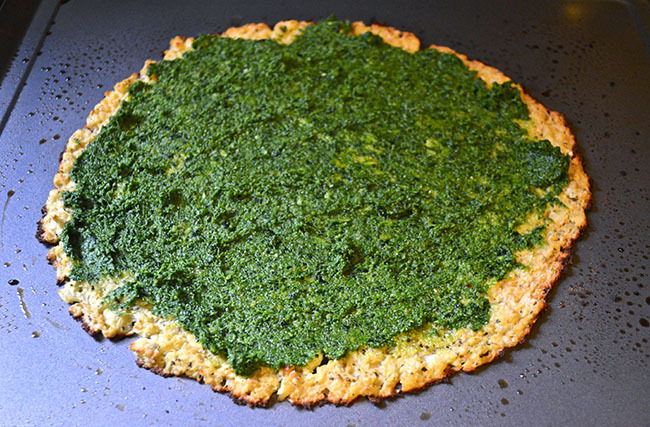 Once mixed, dump on a greased cookie sheet or pizza stone and use your hands to form the crust. Pat it out flat until about 12 inches in circumference. Bake for 8-11 minutes or until lightly browned. We sprinkled a little extra parmesan before we baked the crust to make it extra crusty! Once your crust is finished baking, drizzle a little truffle oil over it. Incredible flavor here people! Then top with a layer of pesto, cheese, tomatoes, onion, pine nuts and finish with more cheese. Put back in the oven for 5-7 minutes, or until all the cheese is melted. 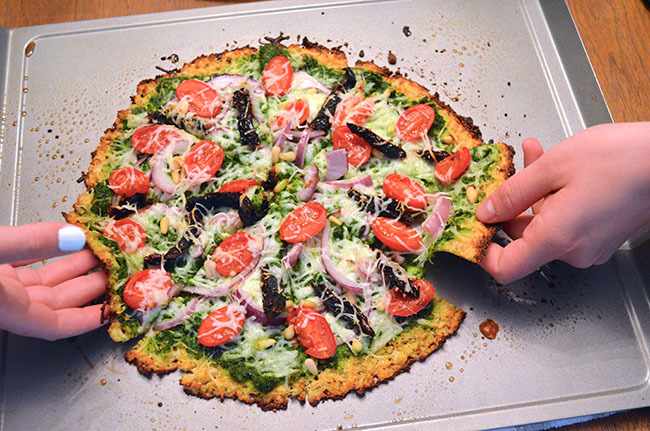 Using a pizza cutter, slice up your za and serve it up!